New rules for political content in signatures and user profiles. See this thread for details. People shouldnt forget why I-69 was pushed out beyond Indy in the first place. It was called the "NAFTA Highway" to facilitate traffic (mostly auto parts) between Mexico and US. With President Trump looking to put the kabash on Nafta in some form, ongoing funding in I-69 could be in doubt. That was the political justification for it, but the reality is folks in Washington, IN & Evansville, IN politically lobbied for it for years and came up with the "NAFTA Highway" idea to get other politicians on board along the route. Hence the division of the corridor into multiple SIU's: done in part so localized politicos (including Congressional folks, of course) could take "ownership" of a specific section of that route and "massage" it through the funding, design, and construction process. As it has turned out, the original corridor instigators -- the Evansville folks and their Texas counterparts -- have managed to translate this into actual functioning facilities within their spheres of influence (with KY entities and the Tunica folks in MS not being too far behind the IN & TX powers that be). NAFTA or not, there's still a hell of a lot of cross-border traffic through Laredo and the lower Rio Grande; it's likely an "official" dimunition of that agreement would only have marginal effects on what is already an established set of international commercial corridors; proposing anything more drastic would bring TX-based "sharp knives" out squarely aimed at the Trump administration -- with most of those from members of his own party! With all new these tariffs going into effect (as of today) the traffic levels at the border could start to drop noticeably. If our country's government gets into a full blown trade war with China and European nations we could see port traffic drop a good bit as well. If the policies are sustained for significant lengths of time both I-69 and I-49 projects could be affected. The stuff with Mexico and Canada will have more immediate effects on I-69 though. As it has turned out, the original corridor instigators -- the Evansville folks and their Texas counterparts -- have managed to translate this into actual functioning facilities within their spheres of influence (with KY entities and the Tunica folks in MS not being too far behind the IN & TX powers that be). Regarding Mississippi, that existing section of I-69 in DeSoto County was already planned and funded pre-69-extension as the MS 304 freeway, hence why it actually came into existance before either the Texas or Indiana extensions.....it didn't take much for MDOT to get that section designated as I-69 since it was already in the pipeline as a new freeway. The only question at the time was whether I-69 would go through Memphis or bypass around. That makes perfect sense, considering that the MS 304 lanes -- serving, of course, the Tunica gaming/recreational area -- constitute the through portion of the split with I-69; which exits via a TOTSO to (maybe/eventually?) 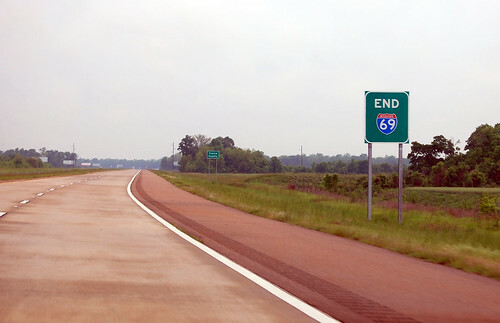 extend SW parallel to US 61. Looks like the stub-end of I-69 was simply grafted onto the existing MS 304 plans. IIRC (I was stationed in Meridian, MS at the time), it wasn't "grafted onto the existing plans" per se. That MS 713 spur was part of the original freeway plans. But the continuation of MS 304 to US 61 was seen as primary (there were already rumors of a southern Memphis area river crossing, which MS 304 would have theoretically tied into), with MS 713 as a secondary spur intended as a "more direct link" to the Tunica casinos and to encourage the casino traffic to use a route other than US 61. When I-69 came about, it was routed onto the MS 713 spur so as to reduce the amount of US 61 mileage needing Interstate upgrading. It sounds like pre-I-69, MS 713 was slated to turn west to serve the southern portion of the Tunica recreational area -- essentially creating a set of "pincers" intended to ferry gaming traffic to as many of the recreational destinations as possible; I-69 planners simply "appropriated" the 304/713 continuum as a foothold for future plans -- as well as a viable way to get the corridor over to I-55. Tunica interests must absolutely love the I-269 concept -- a new regional corridor essentially funneling traffic to their doorsteps! Welcome to the realities of Interstate development in the 21st Century! How far along is AR with its own section of I-69? It looks like the #3 priority here, behind I-49 and I-57. And I'm sure that MS is holding out until the final route has been determined and built. However, at least there's a way for casino traffic to bypass the traffic lights on US 61! The only progress on the AR section of I-69 is the eastern portion of the Monticello bypass (essentially a bypass of existing US 278); this is a SE-quadrant facility which will be initially a 2-lane rural expressway. The only other activity regarding this corridor is identification of a specific routing east from the Monticello section to US 65 near McGehee; apparently that will be similarly constructed over the next decade. As far as any activity at the east (north?) end of the segment -- where the Mississippi River bridge is situated -- it seems any approach segments are not being considered until funding for the bridge itself is identified and secured (can't fault either AR or MS for that; approach work would be premature until bridge details are finalized). Haven't heard a peep about anything veering down into LA toward Shreveport at the west end of the AR segment; that will likely be the last segment on the whole I-69 shooting match to see development, as it doesn't have much independent value as a SIU. At the moment, AR does have bigger fish to fry with its other nascent Interstate routes whose development is significantly farther advanced. It already does that. What now exists between Robinsonville and Hernando is basically what was planned 20 years ago. 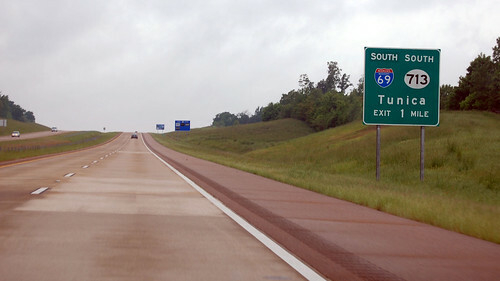 They will take I-69 west as far as the intersection of the Monticello Bypass and the south extension of AR-530, the Super 2 version of I-530 south of Pine Bluff. No land acquisition has taken place between there and El Dorado. Planning has started for the Shreveport bypass up to the Arkansas state line, but I havent found anything definitive going back east to El Dorado. Unless oil or diamonds are discovered in one of those SIU's, it will be at least 20 years before anything happens. I do recall seeing that land acquisition from McGehee to the MS river is underway. It is probably relatively cheap to acquire, and shows progress. What is interesting here is that except for a single reassurance shield assembly in either direction along the I-69 "stub" (signage shared with I-69) and the approach BGS on WB I-69/MS 304, MS 713 garners nary a mention; its intersections with both US 61 and MS 3 are signed in both directions from both N-S highways simply as "TO I-69" with an east-pointing trailblazer. 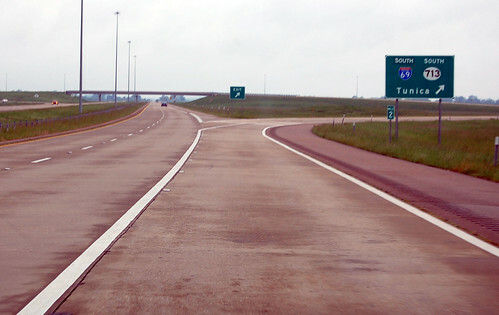 Between MS 3 and US 61 the 5-lane facility is completely unmarked. Because the MS 304 & 713 freeways were completed ('06) well after the decision to route I-69 over them was made, it appears that MS 713, at least as a signed route, is presently considered superfluous for localized navigation, and that I-69 trailblazer signage is sufficient to funnel traffic out of the casino area and onto the regional freeway network. As a 7xx series, 713 would under normal circumstances be a hidden route number to begin with. Most MS 7xx routes (as with the 8xx and 9xx ones) are similarly unmarked. And yet it's up front sharing space on the I-69 exit sign from westbound MS 304. Go figure! In any case, the previous overhead gantry at that exit (showing 2 lanes exiting to 69/713) sure didn't last long. I suppose, since plans for any further I-69 extension from that area are tentative/speculative at best, maintaining a gantry for a stub-end -- particularly since they restriped the exit for a single lane -- might not be the most cost-effective signage option; a standard exit roadside BGS would suffice for the time being. When you come to a fork in the road... TAKE IT. Wow! State-named shields on BGS's -- not the most common practice. Wonder if this is current MDOT practice, or simply a way to save money (affix stock shield to the signs)? 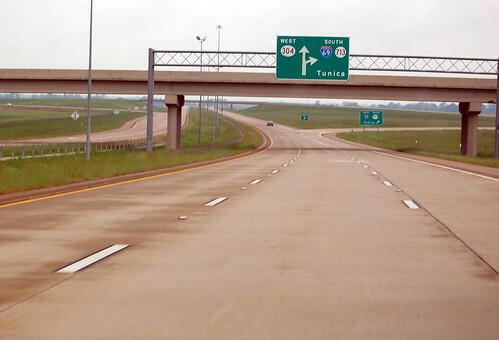 I remember seeing pix of the "END I-69" sign back circa 2006-7; that seems to be the only one sans state name -- likely a holdover from when the facility was opened. In any case, this is the first illustration of the ovehead gantry ahead of the 69/713/304 split (the one just ahead of the overpass); at least the junction is deemed worthy of at least one overhead sign! In any case, nice pix! The shields on the smaller BGS's might be stock Interstate shields to normally mount directly on reassurance sign posts. I don't know about the larger ones though. At either way, I really detest neutered Interstate highway shields. I totally understand why so many DOT agencies use that method: it makes the numerals just as big as those on plain US highway and state highway markers. Nevertheless the end result on neutered shields if often hideous. Numerals are often crammed into the shield. Some signs literally have the numerals hugging the edge of the shield, which ruins any legibility benefit that would come from the larger numerals. Tight spacing between numerals also harms legibility.